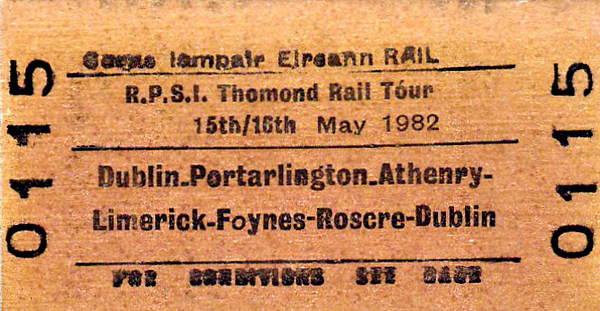 CORAS IOMPAIR EIREANN TICKET - DUBLIN - RPSI 'Thomond' Rail Tour to Limerick and return - Class S 4-4-0 No.171 SLIEVE GULLION took the train from Dublin Connolly to Athlone, where the train split. No.171 took one section to Limerick via Portarlington whilst Class J15 (101) 0-6-0 No.184 took the other via Athenry. On the second day, No.184 ran a short excursion to Foynes and then both engines took the train as far as Roscrea, where No.184 came off, and No.171 continued to Dublin Connolly and failed on arrival.